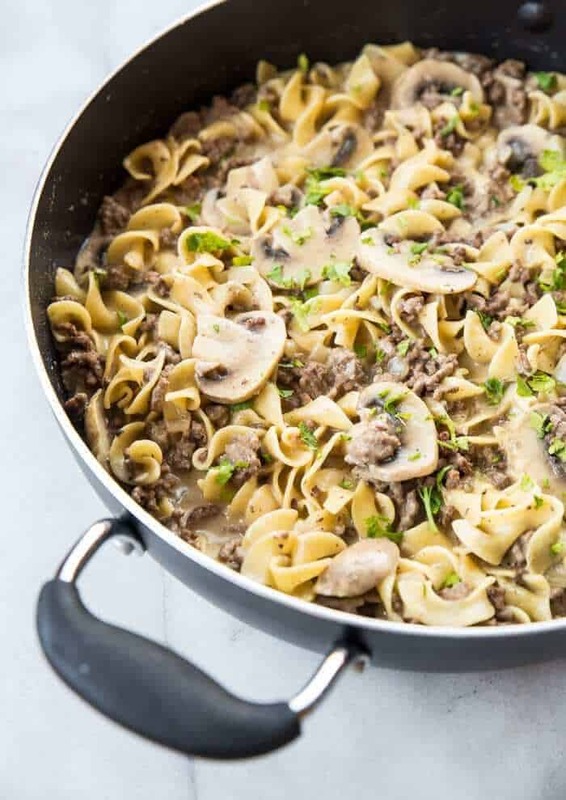 My new One Pot Rich & Creamy Ground Beef Stroganoff & Noodles made my dinnertime easier and it’s going to do the same for you! You guys, my entire family ate this! Sure, my daughter picked out the mushrooms ( that’s more for me then!) but she ate an entire bowl of this while telling me how much she loved it. This is a sure-fire family friendly, kid-pleasing ground beef stroganoff recipe! If you are looking for another ground beef and noodles recipe, try my Sour Cream Ground Beef Noodle Casserole! I have been trying to make a beef stroganoff that Mr Magpie will eat for years. YEARS, you guys. He doesn’t like it. I have made it before and it never hit the website because he didn’t like it. I vowed that I was going to come up with a ground beef stroganoff that he loved. I also wanted to turn beef stroganoff into a one pot or a one skillet meal. 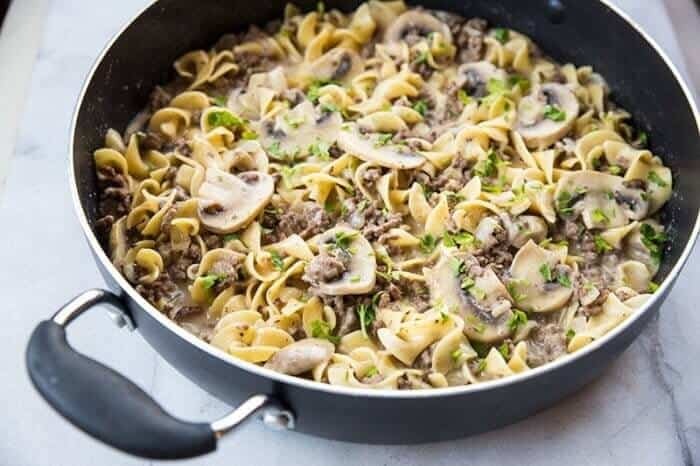 Making the ground beef stroganoff all in one pot and cooking the pasta IN the broth along with the ground beef infuses the noodles with some serious flavour – this is the best stroganoff that I’ve eaten. Not only that, the starches from the pasta thickens up the sauce, meaning that there is no need for a flour thickener at all at the end. 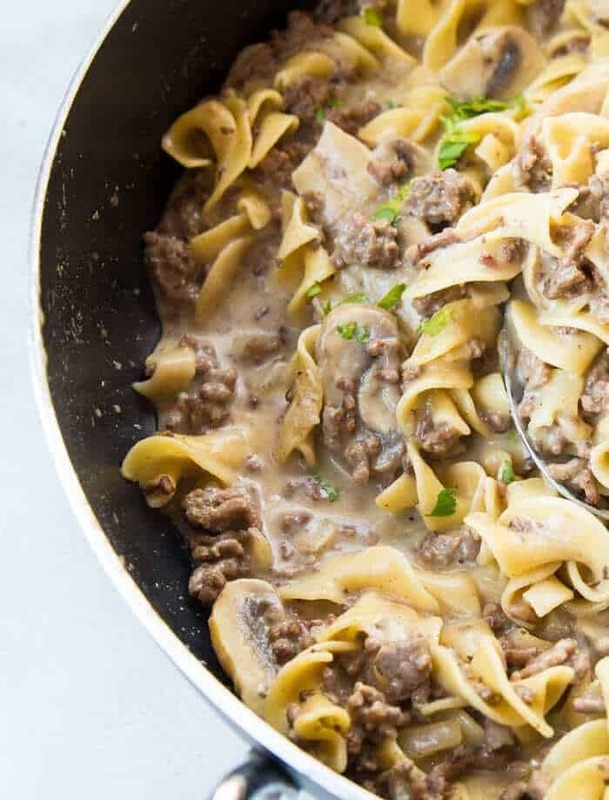 Trust me when I say that making ground beef stroganoff in one skillet is going to change how you eat it from now on. Stroganoff is a classic Russian dish that started out very simply, it was fried beef that was served in smetana ( sour cream.) That’s it. We have turned it into a much more indulgent dish over the years, with flavours and additions galore- including the pasta. 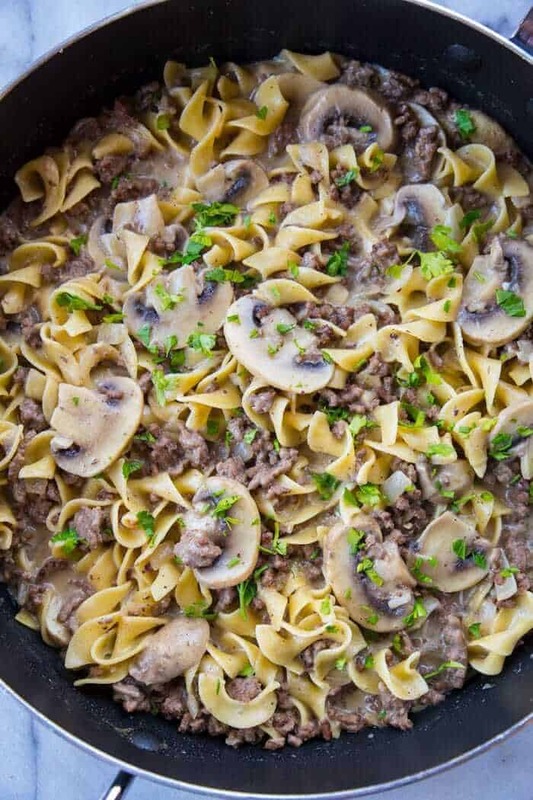 The best part about this ground beef stroganoff being in one pot? No curdling at all! This didn’t even come close to curdling at the end and it’s because of the method and the added starches in the gravy thanks to the pasta. It was completely by accident but I realized that because we are adding all that starch, it helps to prevent the sour cream from curdling. In a normal recipe you simply mix flour into your sour cream, with this recipe you already have starches in the hot gravy to help you out. The flavour secret that makes this ground beef stroganoff amazing? Cream cheese! Yes, I don’t only use sour cream, I added in some cream cheese for extra flavour and creaminess. I also think this is why Mr Magpie loved this version, the tang was subdued. Can You Cook the Noodles Ahead of Time? I’ve had a lot of questions about this and yes, you can precook the noodles ahead of time and add them in. IF you want to do this, cook them to al dente, so that they are still slightly hard. Then follow the recipe instructions for cooking them in the skillet. You want to still have some of the starches left in the noodles, so not fully cooking them helps. Always make sure that your onions are cooked before you add anything else to the skillet. Onions are notorious for not cooking once sauces are added. You can even cook them to the point of slight canalization for some extra flavour. This is why I cook the ground beef and onions at the same time, you need the long cooking time for the onions. You can substitute in ground pork or turkey if you want, but the true depth of flavour in this stroganoff is from the fried ground beef itself. You can feel free to try the other ground meats in it however. If your broth evaporates before your noodles are cooked, simply add in a 1/2 cup more at a time until it’s cooked. I can’t control how fast it’s evaporating from your skillet (temperature you are cooking at, your lid fitting tightly, all out of my control!) so remember that you need to be flexible when it comes to this part. Fresh mushrooms are amazing in this recipe, but feel free to used drained canned mushrooms. You can use beef strips in this recipe as well instead of the ground beef. Simply dredge them in flour and follow the directions. Make sure to save this recipe for when you need a great, easy ground beef dinner. This is going into the permanent rotation for comfort food! If you have slightly pickier eaters, I would start with the amount of sour cream that I used in this recipe. However, if you like a really tangy stroganoff, make sure to add more sour cream to taste. Happy Cooking! If you have any questions leave them in the comments below, and if you loved the recipe, please leave a star review! Pin This Recipe To Your Dinner/Supper Recipes Board and Remember to FOLLOW ME ON PINTEREST! This one pot rich & creamy ground beef stroganoff has a secret ingredient that makes this the BEST stroganoff ever! Place the ground beef in a large skillet, with the salt and pepper, then add in the onion. Cook and stir until the onion is soft and translucent and the beef has browned. Stir in the mushrooms, cook and stir until the mushrooms are tender, about 10 more minutes. Add in the garlic, fry for two more minutes, then drain any remaining grease from the skillet safely. Stir in the beef broth and Worcestershire sauce. Add in the egg noodles and stir to submerge completely in the mixture. Bring to a boil, stirring constantly, then reduce heat to medium low. Cover and simmer until the noodles are cooked, around 20 minutes. If needed, add more beef broth to cook the noodles completely if your liquid evaporates faster than the recipe. Let simmer until you have the amount of gravy you like - we like a lot! Once the noodles are cooked, stir in the sour cream, and cream cheese until combined into the mixture completely. Serve garnished with fresh parsley. Adjust the sour cream and cream cheese to your liking. The way the recipe is, it's a nice, creamy yet not too tangy sauce. If you like it really tangy, add more sour cream or cream cheese. This recipe is brilliant and wonderful! My family loves it. We will be making it again for sure. Adding the pasta to the sauce is brilliant! am terrible at adding flour…this was so much easier. Your recipe is delicious, thank you!! Made this tonight and it was a hit with my picky eater fella. I’ve wanted to make stroganoff at home but the other recipes seemed too labor intensive for my time schedule so this really caught my attention as far as preparation and cook times. It was very easy to prepare and turns out just like the recipe says. 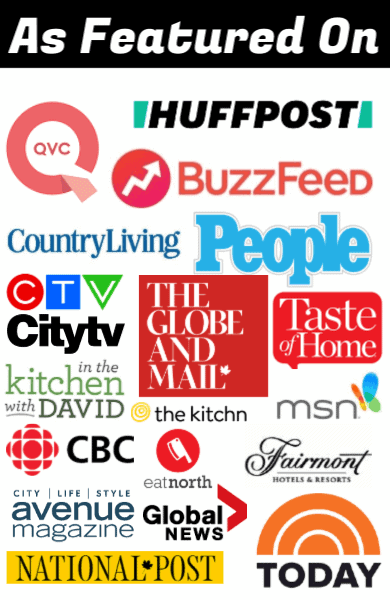 Thank you for helping to add a new recipe to the rotation. I used this recipe tonight and it was a hit with my kids. Because of what I had in the kitchen I made a bunch of substitutes, such as, I had no black pepper, so I used TJ’s Everyday Seasoning, Greek yogurt instead of sour cream, TJ’s black bean spirals instead of egg noodles and Bragg’s liquid amino acids and nutritional yeast instead of Worcester sauce. Also, I eliminated the mushrooms since most of us don’t like them. So, it wasn’t all the same recipe, but it was based on your recipe and it was delicious. I should have started checking the noodles earlier since the type I used cook faster, but the mushiness did not take away from it at all. Thank you for your hard work and sharing it with us! Hi. I have a question about the egg noodles to use. Medium or wide?. I plan to try your recipe out tomorrow (January 3rd 2019) as my 16 yo Step-son has asked me to make him some beef strogonoff. Hi Laura! I like to use the wider egg noodles but it’s really up to you. You might have a little more sauce if they don’t soak it up but that’s not a bad thing! 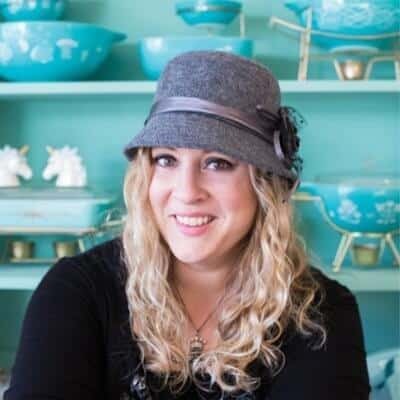 Quick question….are the egg noodles that you added precooked or added uncooked? I watched the video and they looked cooked already because they were soft. Hey, you can precook them to al dente, then continue cooking them in the sauce if you want. Just make sure that they are still a bit hard, as they will continue cooking! I made this last night for dinner my husband and I. We both enjoyed it very much. I did go with a bit extra sour cream. Next time I will add more sour cream and use a better worshershire sauce! We both really liked it and will make it again. Lol hubby mentioned more garlic too. I was looking for recipe that used ground beef, I came across this one. I made it tonight for dinner. My husband and daughter loved. However, I half ground Turkey and half ground beef. Nothing curdled…it was great..
I’d love to make this but I’ve always had problems with the cream cheese curdling…has anyone had that problem? Thanks! This recipe doesn’t curdle, I explain in detail why in the recipe! This is the BEST recipe ever, and I don’t say “best” unless it really works and is the best! I tried this recipe last night and everyone in my family loved it! Will definitely make it again. Thank you for sharing! Family loved it, and there weren’t any leftovers at all which actually made me sad. I’d make a huge batch next time! Thanks for the great recipe as alway! I made this Hamburger Stroganoff tonight and it was so delicious. It was super easy to make. I will make this again. My son who is a chef loved it and he said he is going to make it for his pre kindergarten kids where he is a chef at a pre kindergarten school. Thanks for letting me know!! We loved it, I’m so glad you did as well! Love it. Monday is getting closer and this is a nice way to solve a first week dinner ! Thank you ! It’s a keeper recipe, for sure!